1.In a small bowl combine mayo, vinegar, honey, salt and pepper. Mix well and set aside. 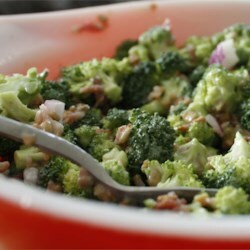 2.In a large bowl combine broccoli, bacon, onion and raisins. Gently stir in the mayo dressing. 3.Sprinkle with sunflower seeds and serve immediately.